Home / TallyERP.9 Lessons / How to create ATM Cash withdraw Entry in TallyERP.9? 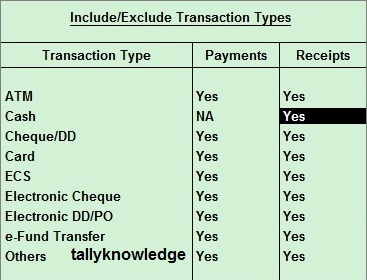 How to create ATM Cash withdraw Entry in TallyERP.9? Generally, when we withdraw cash from bank then we pass a contra voucher or a payment voucher with bearer name. But do you know, we can pass entry to show cash withdrawl from ATM. Just change some configuration to get effect. Select yes to ATM under Payment, you can also select yes to desired transaction types. When you create a payment / contra voucher Press F12 for configuration and select yes to Use Default Bank Allocation. Pass a Contra Entry for Cash withdraw. Cr. Bank and bank allocation screen is appear on your screen, Select ATM from the list, Credit Cash, press Enter or Ctrl + A to save the details. This voucher is defined Cash Withdrawal from ATM.